If you’re an Indiana resident who loves freshwater fishing, make sure you consider Lake Griffin Harbor as a possible place to call home when you retire. Many people say the area around Leesburg, where our beautiful 55+ community is located, is one of the best places to live in Florida because of its close proximity to the Harris Chain of Lakes. This aquatic network not only offers some of the best bass fishing in the state but also countless hours of boating opportunities because of its connections to other waterways, including the popular Silver Springs to the north. Lake Griffin alone spans about 9,400 acres, providing ample opportunities for exploration by boat, canoe, or kayak. Plus, the rolling terrain of this Central Florida region makes it popular for Indiana retirees who want to leave the Snowbelt behind but continue to enjoy gentle shifts in land elevation and a splash of color during the fall foliage season. Many hard-working people dream of owning a retirement home or a winter home on the water but worry that they won’t be able to afford it. At Lake Griffin Harbor, we’ve found a way to make lakefront living affordable, even for many people on a modest budget. We offer high-quality manufactured homes in a gated, attractively landscaped setting with easy access to the water. What’s more, when you purchase one of our homes and make your low monthly home site lease payments, you’ll enjoy unlimited access to our community clubhouse and pool that’s right on the water’s edge. We also provide a fishing pier and boat launch, and boat owners can choose between a 55-slip marina and a dry lot for storage. 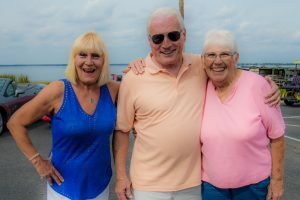 At Lake Griffin Harbor, we’ve already welcomed a number of Indiana residents, so you’ll find plenty of Hoosiers to spend time with, as well as neighbors from other parts of the country. Contact us today to learn more about why Lake Griffin Harbor is one of the best places to live in Florida. Or, better yet, come see for yourself. We’ll be happy to arrange a tour of our community for you when you’re in the area.